Anita Yuen (袁詠儀) and Chilam Cheung (張智霖) have been married for 17 years, but their relationship remains very loving. Anita spilled the secret to maintaining her marriage and keeping her husband in check on ViuTV’s new program hosted by Ocean Chan (陳海琪) and Chip Tsao (陶傑). Despite Chilam’s good looks, sense of humor, and intellect, there are no women going after him. According to Anita, there are tricks to achieve that result. Anita also shared a story of a female admirer ignoring her while greeting Chilam. Later on, she told her husband that he has the responsibility to introduce Anita as his wife. Women approaching Chilam can be avoided if he knows how to prevent unwanted flirting. Thus, she does her best to set a good example for him. Apparently, Anita’s tactics have worked very well in their marriage. 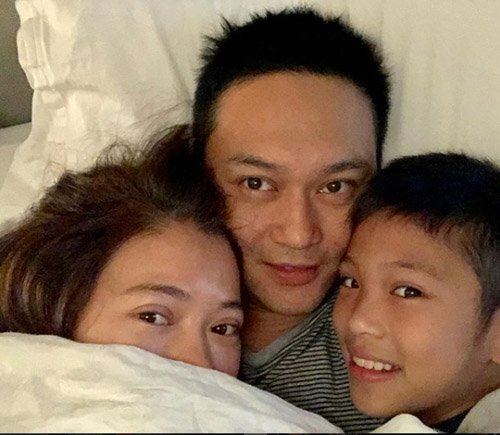 The couple often flaunts their love through family pictures with their 11-year-old son Morton Cheung (張慕童) on social media. @jayne Yes, maybe she should have shared this trick a long time ago with other women and save countless men in the entertainment industry from having affairs! I wonder if this tactic will be helpful for normal folks like us? Hmm…visiting your husband while he’s in the office, or waiting for him after work to go home together. @jayne it also has to be the right guy. Chilam is a good dude, who is not at all flirty, so her check is affective. If a cheater wants to cheat, they will cheat regardless of what the partner does. What Anita does is making sure Chilam knows how to handle the press so her feeling won’t be hurt, and there will no damaging press. It takes a strong guy and gal to resist temptation, especially in the entertainment business where gorgeous men and women spend time together filming for months. After hearing Wu Xiu Bo News And scandals. Jaynestars post a real gentleman Cheung Chi Lam. Both are to smart to do stupid things. High IQ And EQ! Yesterday I watch “Final Score” with Dave Bautista Pierce Brosnan And Chi Lam!! His english is Verry good. Hopely Maybe he can gain more jobs out of sea. His part is not big. But Its must be a great experience to work with a former James Bond. PS: evry1 have watch eclipse storm? Now here’s a couple that is not only compatible, but also actually invests effort into their marriage and understanding each other. It’s obvious that there is good communication in their marriage too (i.e. Chilam not being afraid to tell his wife that he doesn’t like her checking his phone, Anita telling Chilam what she expects of him when it comes to interacting with other women and giving him tips/advice, etc.) – this is one area that not all couples do well so kudos to them! I agree though that it depends on the guy (or gal) and the amount of self-discipline they have, but it’s also about how much they value and respect their partners / families. I admire those artists who make it a point to deliberately avoid putting themselves in risky situations or, if they happen to be in one, do what Anita did and tamp down any possible misunderstanding before it starts – so few men are willing to do this on their own accord, especially men in the entertainment industry, so the fact that Chilam is willing to listen to Anita’s advice (but still assert himself where he feels necessary) speaks volumes about how comfortable they are with each other and the confidence they have in their marriage. Always enjoy hearing about this couple! A marriage where you have to check on your spouse, have ‘spies’ report back to you, cling on to him in public so people know you are married to him, that is not 17 years of blissful marriage, and if i were her, it’s not something i would gloat about. That is not a loving relationship, and it is definitely not a secret to a happy marriage. If he wants to cheat, no amount of eyes prevent it. No trust, no happiness. @winnie how strong is that trust when there’s temptation everyday? you only need one moment of weakness in order to break any trust in place. compounded with distance and endless options, hell, I’d say cheating is easier than taking candy from babies. Instead of putting stock in trust, it’s much better to reinforce it by “observing” him and letting her presence be known. If he knows he can’t escape, he’ll be resigned to his role. Spies, trust, showing up on the set and what not, all these are useless if the man does not exercise self control in the face of temptation. Anita is lucky that Chilam is a responsible man who doesn’t think with the lower half of his body. They are cute. It’s so refreshing to see a devoted couple and loving family. Mixed feelings. On one hand, if that’s how their relationship is and they’re both happy good for them. On the other hand, if it was an actor telling all these things he would be deemed controlling in a much harsher way. @peanutbutterjelly My thoughts exactly!! Mixed feelings indeed. AY always comes me to off as a bit of a controlling woman and a bit arrogant as well but hey whatever floats their boat. lol… I never thought of them as this loving loving relationship.